To be held on Thursday, February 21, talent has been announced for the Fresno Grizzlies' 58th-Anniversary Hot Stove Event presented by Chukchansi Gold Resort and Casino, and a change of venue to Warnors Theatre in Downtown Fresno. 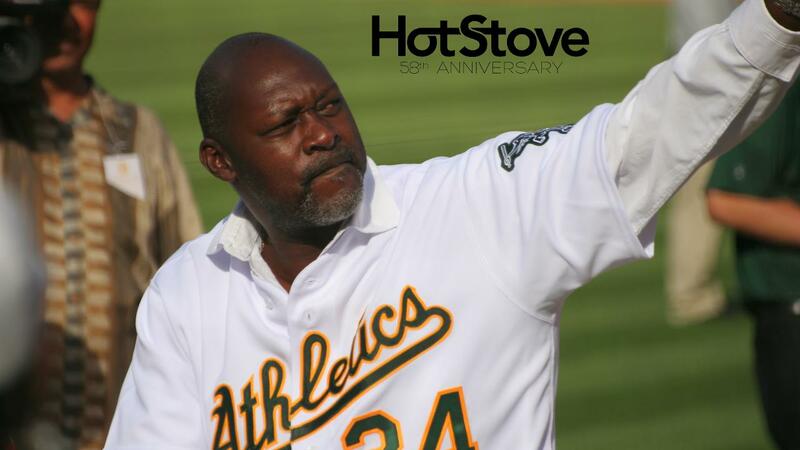 Beloved former Oakland Athletics pitcher and three-time World Series champion Dave Stewart will deliver the keynote remarks and take questions from fans in a more intimate setting compared to past events. Autographs are also encouraged following the program (for kids 12 and under first, before adults). Donaghy Sales is also a sponsor of the event. Admission price has been reduced, for a more family-friendly affair. Available by calling Madeline Hamada in the Fresno Grizzlies front office at 559-320-2542, tickets are $30 for adults and just $10 for children 12 and under (RSVP online, check in at event). For the price of $55 ($25 age 12 and under), patrons will be treated to a VIP meet and greet with Dave Stewart and the other featured guests (see below) at the event from 6 to 7 p.m., and VIP admission will include preferred seating in the theatre. Doors will be at 6 p.m. for both the VIP reception and general public. The program will run from approximately 7 to 8:45 p.m.
"We went into planning this year's event with two questions in mind: How do we make Hot Stove more inclusive for all of our fans, and how do we make sure more kids are at the event to learn about baseball?" said Fresno Grizzlies president Derek Franks. "We found our answer in a great setting at Warnors, to where we could significantly lower the average ticket price. Huge thanks is due to Warnors Theatre for hosting us, and our lineup of guests for being so gracious with their time." Despite the new format, the evening will still include the awards typical of past Fresno Hot Stove events, including the Al Radka Award and the baseball and softball Player of the Year Awards for area high schoolers. While no longer a dinner event, appetizers and a hosted bar are included in the price of a VIP admission. Concessions will be open for all other guests to purchase drinks and snacks. A silent auction, including memorabilia raffles will also be included, with Fresno Unified School District Athletic Department as the main beneficiary. Dave Stewart (Keynote Speaker): A veteran of 523 games pitched in the Major Leagues, as one of the best starting pitchers of the late 80s and early 90s. Between 1987 and 1990 with the Oakland Athletics, Dave Stewart finished between second and fourth in American League Cy Young Award voting four consecutive seasons, also receiving MVP votes three straight years between 1988 and 1990. Selected to the All-Star Game in 1989, Stewart pitched a no-hitter on June 29, 1990 against the Blue Jays in Toronto. Stewart helped three separate franchises to World Series titles during his 20-year professional career; the Dodgers in 1981, the A's in 1989 and the Blue Jays in 1993. Currently a member of the Oakland A's television broadcast team, Stewart also served as General Manager of the Arizona Diamondbacks between 2014 and 2016. Terry Pendleton: An integral piece of the Atlanta Braves during their run of perennial playoff squads between 1991 and 1996, former Fresno State Bulldog Terry Pendleton played professionally for 17 seasons following his senior year of 1982, making his Major League debut just two seasons later with the St. Louis Cardinals. The ever-durable Pendleton appeared in 140 or more games in a season seven times during his big league career, including all 162 with the Cardinals in 1989, and 160 and 161 with the Braves in 1991 and 1992, helping guide Atlanta to consecutive National League pennants. He accumulated 1,897 career Major League hits, in 1,893 MLB games. Leading the National League with 187 hits in '91, Pendleton edged Pittsburgh's Barry Bonds for the NL Most Valuable Player Award. Leading the NL in hits again in '92 with 199, Pendleton was runner-up for MVP, only Bonds standing in his way. C.J. Wilson: One of the most recognizable names in baseball during his 11 Major League seasons, C.J. Wilson went from being a work-horse reliever for the Texas Rangers (2005-2011) to one of the premier starters in baseball for the Los Angeles Angels of Anaheim (2012-2015). Wilson was selected to consecutive MLB All-Star Games in 2011 and 2012 for both the Rangers and Angels, leading the American League with 34 starts each season. With a career-best 2.94 ERA in 2011, Wilson received Cy Young Award votes before becoming the most sought-after hurler on the free agent market. In 2013 with Anaheim, he posted a career-high 17 winning decisions, and retired with a 3.74 career ERA as a big leaguer. The Southern California native has since relocated to Fresno, where he operates the BMW Fresno, Audi Fresno and Porsche Fresno dealerships.